All but one of the pieces on this release follow a more or less classical form of sonata allegro in the first and last movements, separated by a slow and a scherzo-like movement. First on offer here is the Szeligowski, about whom there is very little biographical information in the liner notes. From the research I�ve made, he is one of the legion who studied with Boulanger. Stravinsky is counted as a decided influence on his music, as can be evidenced here. Aside from a good number of chamber pieces, his works include a clarinet concerto, a piano concerto, choral and piano works. The quintet here begins as a rather innocent-sounding march which gets slightly more agitated before moving into more interesting emotional territory with a darker, more brooding second statement. The second movement, Andante cantabile, leaves the narrative line to the oboe, before trading it off to the flute. The timbres of the instruments here keep the mood from becoming too sombre. This movement is lovely, but like the rest of the piece, offers few surprises. The scherzo movement that follows has a slightly melodramatic feel � one could easily imagine a chase scene in a silent comedy film where, though the situation is dire, the context lets you know to expect a laugh when the villains eventually meet up with the business end of a swinging board or a floor-full of ball bearings. The finale keeps things animated, with all of the instrumentalists fully involved, then a fugal treatment of fragments of the original first theme before the flute and oboe announce the end of the piece. Following, we have Bacewicz�s wind quintet of 1932, composed while she was in Paris. She, too, studied with Boulanger. Bacewicz, whose name is gradually becoming better known in countries outside of Poland, composed quite a wide range of chamber music, from her string quartets - for which she is best known - to piano quintets, to works for various instruments with piano. The opening statement is definitely reminiscent of Prokofiev. It is a bit more jocularly offhand with regard to dissonance than Szeligowski�s quintet; it flirts with the idea of being a suite, which, as the liner notes mention, the designation of Air to the second movement indicates. This slow movement has the feel of suspension about it, with the parts all hovering, creating expectancy before the third movement, which is not much more scherzo-like in character than the first movement � that is, until the brief comedic statement by the clarinet. Of the works by Bacewicz I�ve heard, this one, while pleasant, seems less a statement of substance and more a simple aim at entertainment. Kilar, who I was introduced to through his enjoyable film music, is next on the programme, with his quintet, written twenty years after the Bacewicz and almost simultaneously with the Szeligowski. Kilar, of the composers here, seems to have the most persistent attraction to wind instruments, with all of his chamber compositions involving winds. The opening movement, entitled Sinfonia, retains a filmic character and could almost be heard as an "opening credits" piece, with the theme sternly and emphatically stated in unison at the end. The scherzo plummets through the ranks of the quintet in series. There is a section of folk-inflected music before the downward run ripples through the ensemble again, bringing us back to the first theme. Of the works heard on this disc so far, this is the one that has the ability to surprise, as in the delightfully amusing and busy finale, which, after a brief quiet interlude and wound-up glissando from the clarinet, suddenly goes clattering off like a collection of spring-powered toys in all directions. 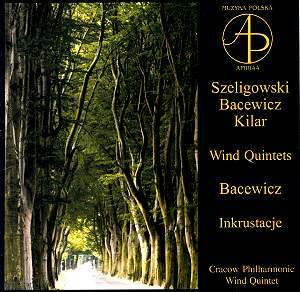 An amusing delight that the Cracow Philharmonic Wind Quintet performs wonderfully. The disc is closed by Incrustations, a late piece by Bacewicz. Acte Préalable has championed this composer, releasing no fewer than seven discs that feature her work. Word is getting out, with other artists and labels releasing performances, such as the extremely interesting 4th string quartet, recently featured on a disc by the Szymanowski Quartet on Avie ( review ). Incrustations, here, is a bit of an enigma on its own, and an enigma also when compared with the other pieces on this disc. It is scored "for horn and chamber ensemble," a septet, rather than a traditional wind quintet. Bacewicz�s trio for oboe harp and percussion, reviewed here (review) was written at the same time and has similarities in sound and structure. Both also quote an earlier work; a 1955 Partita. The oboe acts as the main voice of the ensemble. The tried-and-true structures such as sonata-form found in the other works are not made use of. The composer appears to be focusing mainly on tonal coloration and exploration of timbre possibilities of the instruments used. This makes for a sometimes difficult listening experience, but the piece holds interest, more so than the first two works, pleasant though they are. Overall, this disc comes recommended for those who love new repertoire and who have affinity for wind instruments. The Kilar is a delight, and I�ve found myself coming back again and again to puzzle over Incrustations, though I am not the wiser. The ensemble is very well recorded and extremely well balanced in sound and recording aesthetic. An enjoyable and occasionally challenging release.